Arlene R. Barro, PhD, a nationally recognized search consultant and career coach who is an educator, behavioral educational psychologist, and evaluator. Dr. Barro holds a PhD with distinction from UCLA for her doctoral dissertation on creativity. Her pioneering research monograph on measuring physician performance for the Association of American Medical Colleges changed the course of medical education throughout the world and led to her appointment as a visiting professor in the medical education department at Ben Gurion University in Israel. She served as a dean at the medical school of the State University of New York at Stony Brook and as a professor at Thomas Jefferson University’s medical school in Philadelphia. At the National Cancer Institute (NCI), National Institutes of Health, Dr. Barro administered a $60 million public and professional education program, founded and directed the NCI’s first educational research and evaluation branch, and envisioned and directed a first-of-its-kind national program to educate physicians and other health professionals about disease prevention, with a focus on cancer. She has served as the guest editor for professional journals, contributed articles on many topics, and was the creator of the Anti-Cancer Audiobook Series, recommended for the general public by the American Library Association. Following a long career in the medical field, during which time she held a number of positions usually occupied only by physicians, Dr. Barro joined Search West, an established leader in the professional search industry, where she became director of the company’s Healthcare Services Division, creating the Right Fit Method™ in response to the critical need she perceived to improve hiring and career-search practices in every business sector. Eight years later, she established barro global search, the firm she continues to lead. A colleague's admiring remark that, throughout her career, Dr. Barro has “set a standard against which no one else can compete” is a truth that this Renaissance woman continues to live by. This high standard underscores her success in each of her career challenges and has enabled her to effect important and lasting innovation. And it is a core principle of the Right Fit Method, which continues to revolutionize the way in which candidates, employees, entrepreneurs and employers successfully meet their career, business, and life goals. Dr. Barro lives in Los Angeles. 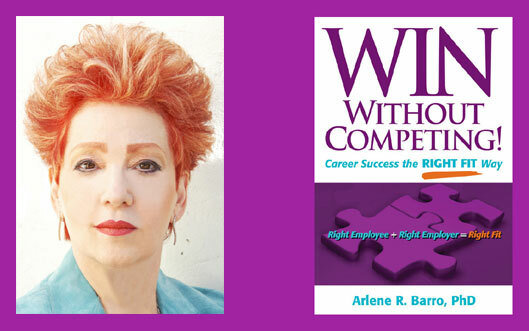 A featured host on BlogTalkRadio, Dr. Arlene on her WIN Without Competing! show excites the audience about her Right Fit Method. To learn more about the Method, read WIN Without Competing! Visit Dr. Arlene Barro's Speakers Page on American Entertainment International Speakers Bureau and her topic descriptions. To invite Dr. Barro to speak, email Jennifer Orell, American Entertainment International (AEI) Speakers Bureau, or call her at 617-782-3111 Ext. 118. To contact Dr. Arlene Barro call 310-443-4277.